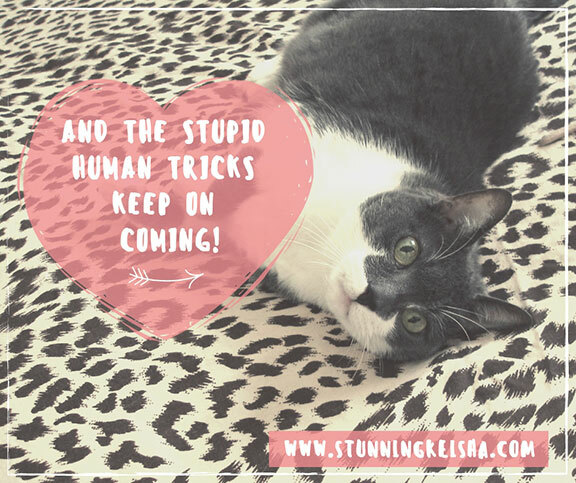 Stunning Keisha: And the Stupid Human Tricks Keep on Coming! 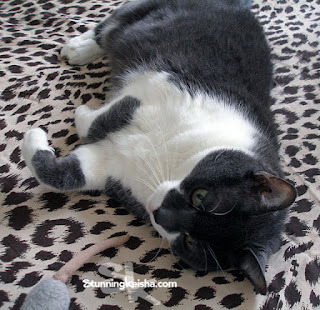 Hola kitties! Whoa! The stupid human tricks keep coming! Just when I think I've caught you up, there are others. It comes with the territory from having elderly peeps. We got a new printer to go with our new computer. Of course, we're still using the old computer but Pop decided to change out the printer since the old one wasn't printing anyway. Well, it's not exactly a new printer. It's been sitting and gathering dust for a few months. Our old printer was OK for scanning but hadn't been printing right for a long time. We hardly use it so when we need it, the ink is dried up or the print heads are clogged. Anyhoo, Pop took it out of the box and set it up. TW and I were in the other room so we didn't see the first part of the adventure. We did see Pop carry the old printer out and put it near the door. TW came in and axed if ENVY was set up. Pop replied there was no room on the power strip to plug it in which was odd since there was a spot for the old printer. The peeps started pulling on cords to see which went where. They couldn't find any unnecessary ones to pull out. Then TW axed if Pop had unplugged the old printer cos she didn't remember seeing the plug with the printer waiting to be tossed. Whoops! But which plug was the one going nowhere. Whoops! The CD-ROM drive doesn't work with High Sierra. The disk was in there with no way to eject it. It just wasn't being recognized. It came out when the computer was turned off by the grace of you-know-who. BUT—and this is a big but—the next time they turned on the computer, it seemed to be looking to boot off the disk. It just circled around until it realized it had to boot off the hard drive. TW was sure at that point, they'd killed the Mac. Fast forward a week when TW found a few minutes to download the printer drivers. Lift-off went smoothly until TW wanted to print her shopping list. PRINTER OFF-LINE! PRINTER NOT FOUND! For a reason unbeknownst to me, she called for Pop's help. While he was screwing around, she realized that they hadn't changed the default printer so it was looking for the old one. I hope I haven't totally bored you and some of you might even have found this funny. Sigh. How many #senile oldsters does it take to change a printer? Stay tuned next week to find out why your dishes don't get cleaned unless you turn the dishwasher on. Oh my, you sure are having some techie fun CK and I hope you get the new computer working soon. Wow! And we thought only mom did stuff like this. MOL. Thankfully you're around to supervise and crawl into those tiny spaces the humans can't. Do we need to send our folks back to school? Naaa, they have us!Great pics! 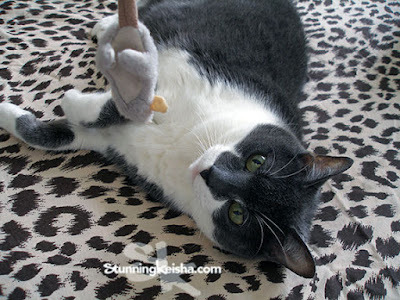 OMC that's exactly the kind of thing that happens here! We have a scanner/printer that Mom can NOT figure out how to hook up to her computer. Haha I'd be just like your peeps :-) And how many times I failed to turn on dishwasher? Love your photos and the painting! Well, CK, I was sort of chuckling but - only because the same things has happened to me. That tech stuff tends to present most peeps with trouble, CK. For some reason, the part that made us MOL was "Fast forward a week..."
This sounds like all of us at times. A mystery why things don't work hangs on peeps behaviour or lack thereof.